Is Pet Insurance an Option for CH Cats? Considering all of the trouble cerebellar hypoplasia kitties can get into, some parents wonder if they can purchase insurance coverage for them. After all, who knows when the next tumble, fall or crash will result in a serious injury — and even more serious medical bill. So is pet insurance an option for CH kitties? Pet insurance companies, like their human counterparts, aren’t necessarily willing to offer coverage to those who may have potentially expensive health conditions. And unfortunately, cerebellar hypoplasia seems to fall under one of the many categories of conditions that pet insurance companies won’t cover. I think this term is often generally applied to any condition your pet may have, which could lead to a denial of coverage. I’ve heard cerebellar hypoplasia called a pre-existing condition, and while it is in a broad sense, we’ll get to the nitty gritty in a bit. This term refers to illnesses or injuries your pet had prior to coverage. However, conditions that come up after your pet’s coverage begins can also be considered pre-existing, even if there weren’t any signs or symptoms earlier, like diabetes. Some companies may cover pets who have pre-existing conditions with partial plans, but usually not full-health coverage plans. Hereditary conditions are genetically predetermined, based on the chromosomes inherited from the mother and/or father. Some policies may extend limited coverage for these conditions, which can include hip and elbow dysplasia. Many are breed-specific, and from what I could tell, usually found in dogs. This category refers to conditions and disorders that exist at birth that are caused by genetic abnormalities or other factors, like cerebellar hypoplasia. They’re all considered pre-existing. I’ve heard that some insurance companies DO cover cerebellar hypoplasia, but in my research, I haven’t seen this to be true, as many won’t cover congenital conditions or any injury that could be tied to it. If you’d really like to have your pet covered by insurance, get a few quotes and call the companies to see what they can offer you. Make sure any coverage they offer, especially pertaining to CH, is received in writing. Even if your pet does have a pre-existing condition, you can still get partial coverage for your pet. For example, from the ASPCA Pet Insurance company, CG (3-years old, with CH/neurological issue as his pre-existing condition) is eligible for level 1 care ($8.50/month), which includes coverage for broken bones, scrapes, poison ingestion, lacerations, burns, bee stings and other accidents. 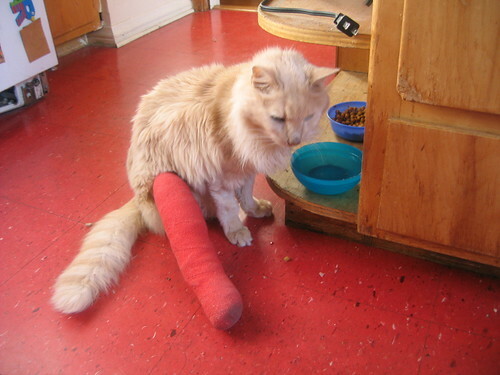 There’s a $100 deductible, and then ASPCA Pet Insurance covers 80%. However, here’s where there’s a fat gray line: Any of those accidents (other than the bee sting) could be caused by CH. So how would you prove it if that wasn’t the case? Some CH parents have decided to skip insurance altogether, and instead set up a credit card or special savings account where they put away a bit each month in case of emergency. While this may not offer you any savings, it may provide a peace of mind that you may not have with limited insurance. Have you looked into pet insurance for your CH cat? What did you find out? Do you have partial insurance, or have you found another way to pay for emergencies? Please share! ← Do You Think They Know? Does Your CH Kitty Recognize CH In Other Cats?